This article is about the West Bank and the Gaza Strip. For the historical region, see Palestine (region). For the modern-day state, see State of Palestine. For other uses, see Palestinian territories (disambiguation). Used in Gaza Strip since 1951. Used in West Bank since 1950. Palestinian territories has been used for many years to describe the territories occupied by Israel since 1967, namely the West Bank (including East Jerusalem) and the Gaza Strip. More recently, the official United Nations terminology  has been used, occupied Palestinian territory (OPT or oPt) increasingly replacing other terms since 1999. The European Union also has adopted this usage  The International Court of Justice refers to the West Bank, including East Jerusalem, as "the Occupied Palestinian Territory" and this term is used as the legal definition by the International Court of Justice in the ruling in July 2004. The term occupied Palestinian territories is also still in common use. The term "Occupied Palestinian Territory" was used by the United Nations (UN) and other international organizations between October 1999 to December 2012 in order to refer to areas controlled by the Palestinian National Authority. On 29 November 2012, UNGA 67/19 reaffirmed "the right of the Palestinian people to self-determination and to independence in their State of Palestine on the Palestinian territory occupied since 1967" and decided "to accord to Palestine non-member observer State status in the United Nations". In December 2012, a UN legal memorandum discussed appropriate terminology to be used following GA 67/19. It was noted therein that there was no legal impediment to using the designation Palestine to refer to the geographical area of the Palestinian territory. At the same time, it was explained that there was also no bar to the continued use of the term "Occupied Palestinian Territory including East Jerusalem" or such other terminology as might customarily be used by the Assembly. The ISO adopted the name change in 2013. The UN Security Council continues to treat Palestine as a non-sovereign entity, preventing its admission to UN General Assembly membership as a full member state. Israeli governments have maintained that the area involved is within territorial dispute. The extent of the territories, while subject to future negotiations, have frequently been defined by the Green Line. Israel occupied the West Bank and the Gaza Strip in the Six-Day War of 1967 and has since maintained control. Previously, these territories had been ruled by Jordan and Egypt, respectively, since the 1948 founding of Israel. In 1980, Israel officially absorbed East Jerusalem and has proclaimed the whole of Jerusalem to be its capital. The inclusion, though never formally amounting to legal annexation, was condemned internationally and declared "null and void" by the United Nations Security Council. The Palestinian National Authority, the United Nations, the international legal and humanitarian bodies and the international community  regard East Jerusalem as part of the West Bank, and consequently a part of the Palestinian territories. The Palestinian National Authority never exercised sovereignty over the area, although it housed its offices in Orient House and several other buildings as an assertion of its sovereign interests. Israeli sovereignty, however, has not been recognized by any country, since the unilateral annexation of territory occupied during war contravenes the Fourth Geneva Convention. The cost of the occupation for Israel over four decades (1967–2007) is estimated to amount to $50 billion. The World Bank estimates the annual cost in 2013 to the Palestinian economy of Israeli occupation at $3.4 billion. In 1988, with the Palestine Liberation Organization (PLO) intention to declare a Palestinian State, Jordan renounced all territorial claims to the West Bank, including East Jerusalem. Since the Palestinian Declaration of Independence in 1988, 135 UN Member Nations have recognized the State of Palestine, comprising the Palestinian territories. It has not been recognized by Israel and some Western nations, including the United States. In 1993, following the Oslo Accords, parts of the territories politically came under the jurisdiction of the Palestinian National Authority (Areas A and B). Israel still exercises full military control and, civil control over 61% of the West Bank (Area C). The Oslo Accords established access to the sea for Gaza within 20 nautical miles from the shore. The Berlin Commitment of 2002 reduced this to 12 miles (19 km). In October 2006 Israel imposed a 6-mile limit, and at the conclusion of the Gaza War restricted access to a 3-nautical-mile limit, beyond which a no-go zone exists. As a result, more than 3,000 Palestinian fishermen are denied access to 85% of the maritime areas agreed to in 1995. The majority of the Dead Sea area is off-limits to Palestinian use, and Palestinians are denied access to its coast line. Israel disengaged from the Gaza Strip in 2005, however the international community considers the West Bank and the Gaza Strip still to be occupied by Israel. The Hamas takeover of Gaza in 2007 divided the Palestinian territories politically. Abbas's Fatah largely ruled the West Bank and was recognized internationally as the official Palestinian Authority (see: Fatah-Hamas conflict). In 2014, the two political groups agreed to hold elections and form a compromise unity government. The 2014 Israel–Gaza conflict intervened; however, the unity government survived. The United Nations, the European Union, International Committee of the Red Cross, and the government of the United Kingdom all refer to the "Occupied Palestinian Territory" or "Occupied Palestinian Territories". 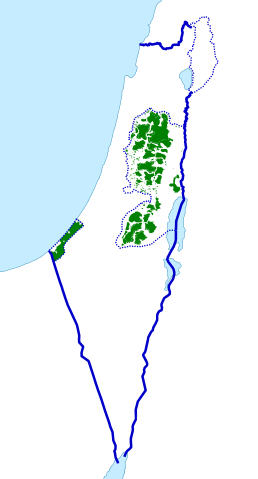 Other terms used to describe these areas collectively include "the disputed territories", and "Israeli-occupied territories". 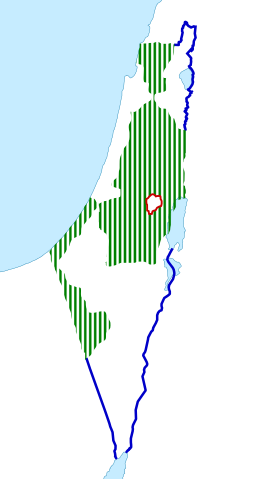 Further terms include "Palestine", "State of Palestine", "Yesha" (Judea-Samaria-Gaza), "Yosh" (Judea and Samaria), the "Katif Bloc" (the south-west corner of the Gaza Strip), "Palestinian Autonomous Areas" (although this term is also used to specifically refer to Areas A and B), "Palestinian Administered Territories", "administered territories", "territories of undetermined permanent status", "1967 territories", and simply "the territories". Many Arab and Islamic leaders,[who?] including some Palestinians,[who?] use the designation "Palestine" and "occupied Palestine" to imply a Palestinian political or religious claim to sovereignty over the whole former territory of the British Mandate west of the Jordan River, including all of Israel. Many[who?] of them view the land of Palestine as an Islamic Waqf (trust) for future Muslim generations. A parallel exists in the aspirations of David Ben-Gurion, Menachem Begin, and other Zionists and Jewish religious leaders[who?] to establish Jewish sovereignty over all of Greater Israel in trust for the Jewish people. However, this dispute is not related to religion for many Arabs, but simply an issue of rights, as the land was inhabited by Arabs (as well as a minority of Jews) before the Zionist movement began. Many Israelis[who?] 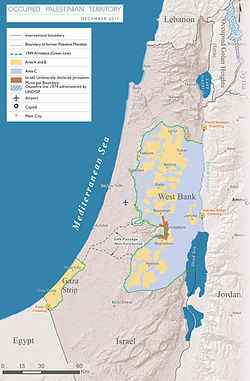 object to the term "Occupied Palestinian Territories" and similar descriptions because they maintain such designations disregard Israeli claims to the West Bank and Gaza, or prejudice negotiations involving possible border changes, arguing that the armistice line agreed to after the 1948 Arab–Israeli War was not intended as a permanent border. Dore Gold wrote, "It would be far more accurate to describe the West Bank and Gaza Strip as "disputed territories" to which both Israelis and Palestinians have claims." The Palestinian Territories consist of two distinct areas: the West Bank (including East Jerusalem) and the Gaza Strip. Although the boundaries are commonly referred to as the "1967 borders", they are historically the armistice lines under the 1949 Armistice Agreements, which brought an end to the 1948 Arab–Israeli War, and are commonly referred to as the Green Line. The 1949 armistice lines were expressly declared to be armistice lines, and not international borders. Some Palestinian negotiators have claimed a return to those lines as the borders of a future Palestinian state, while Hamas does not recognize the State of Israel at all. The Arab League has supported these boundaries as the borders of the future State of Palestine in the 2002 Arab Peace Initiative. The eastern limit of the West Bank is the border with Jordan. The Israel–Jordan peace treaty defined that border as the international border, and Jordan renounced all claims to territory west of it. The border segment between Jordan and the West Bank was left undefined pending a definitive agreement on the status of the territory. The southern limit of the Gaza Strip is the border with Egypt. Egypt renounced all claims to land north of the international border, including the Gaza Strip, in the Egypt–Israel Peace Treaty. The Palestinians were not parties to either agreement. The Gaza Strip is bounded by the Mediterranean Sea. The natural geographic boundary of the West Bank, as the name implies, is the Jordan River. To the Territories belong the territorial waters of the Gaza Strip and the part of the Dead Sea between the West Bank and the Jordan border-line (see adjacent CIA map), which are also completely controlled by Israel. The Palestinian territories are part of the area intended by the United Nations to become the territory of the future State of Palestine. Originally, a larger area was allotted to the planned Palestinian state in Resolution 181 of 29 November 1947, but the Arabs rejected it and in the 1948 Palestine war, the Israeli army conquered major parts of it. While in the Partition Plan about 45% of historic Palestine was destined for the Arabic state, the Palestinian territories constitute only some 23%. The last figure is including all space occupied by Israeli settlements, walls and roads. In the UN, nearly all countries voted in favour of Resolution 58/292 of 17 May 2004; namely, that the boundaries of a future Palestinian state should be based on the pre-1967 borders, which correspond with the Green Line. The Resolution affirmed, in connection with the Palestinian right to self-determination and to sovereignty, that the independent State of Palestine should be based on the pre-1967 borders. In Resolution 43/177 of 15 December 1988, the declaration of independence of the State of Palestine was acknowledged by the UN General Assembly, but it was not admitted as a member state. In the same resolution, their sovereignty over the Occupied Palestinian Territories was recognized. On 29 November 2012, the UN General Assembly passed United Nations General Assembly resolution 67/19 changing Palestine's observer status at the UN from "entity" to "non-member state" by a vote of 138 to 9, with 41 abstentions. Palestinians regard East Jerusalem as the capital of the future Palestinian state. East Jerusalem is generally recognized as part of the Palestinian Territories. In UN resolutions concerning Israel, East Jerusalem is routinely referred to as part of the West Bank or as part of the Palestinian Territories. According to the Israeli Supreme Court, the Fourth Geneva Convention, which prohibits unilateral annexation of occupied territory, does not[dubious – discuss] apply to East Jerusalem, as there was no[dubious – discuss] "legitimate sovereign" recognised by Israel and its allies previously exercising control over the territory. In Israel, there has always been large support for retaining all of Jerusalem under Israeli sovereignty, although opinions differ regarding the large number of outlying Palestinian villages and neighbourhoods annexed to Jerusalem beyond "core" East Jerusalem (the Old City, Sheikh Jarrah and the large post-1967 Jewish neighborhoods such as Ramot, Ramat Eshkol, French Hill and Gilo). A few times, there were Israeli or U.S. proposals to divide East Jerusalem between Israel and the Palestinians. In the 1995 Beilin–Abu Mazen agreement, Israeli negotiators proposed Palestinian sovereignty over some Arab neighborhoods within an expanded Jerusalem that would include annexed Israeli neighborhoods and major settlement blocs. In 2000, U.S. president Bill Clinton offered a similar proposal in his Clinton Parameters. In more recent years, the Israeli position has strongly been favourable to keeping all of Jerusalem under Israeli sovereignty. Israel remains an occupying Power in respect of Gaza. Arguments that Israel ceased its occupation of Gaza in 2005 following the evacuation of its settlements and the withdrawal of its troops take no account of the fact that Israel retains effective control over Gaza by means of its control over Gaza's external borders, airspace, territorial waters, population registry, tax revenues and governmental functions. The effectiveness of this control is emphasized by regular military incursions and rocket attacks. The political status of the territories has been the subject of negotiations between Israel and the PLO and of numerous statements and resolutions by the United Nations. (See List of United Nations resolutions concerning Israel.) Since 1994, the autonomous Palestinian National Authority has exercised various degrees of control in large parts of the territories, as a result of the Declaration of Principles contained in the Oslo Accords. The United States government considers the West Bank and Gaza as a single entity for political, economic, legal and other purposes. The State Department and other U.S. government agencies, such as USAID West Bank and Gaza, have been tasked with projects in the areas of democracy, governance, resources, and infrastructure. Part of the USAID mission is to provide flexible and discrete support for implementation of the Quartet Road Map. The Road Map is an internationally backed plan that calls for the progressive development of a viable Palestinian State in the West Bank and Gaza. Participating states provide assistance through direct contributions or through the Palestinian State account established by the World Bank. Hamas should be given a clear choice, with a clear deadline: they either accept a new government that meets the Quartet principles, or they reject it. The consequences of Hamas' decision should also be clear: If Hamas does not agree within the prescribed time, you should make clear your intention to declare a state of emergency and form an emergency government explicitly committed to that platform. During Operation Cast Lead the UN Security Council adopted Resolution 1860 (2009), which said that the Gaza Strip constitutes an integral part of the territory occupied in 1967 that will be a part of the Palestinian state. On 15 December 2011, Iceland recognized Palestine as an independent and sovereign state within the pre-1967 Six-Day War borders; Össur Skarphéðinsson, Minister for Foreign Affairs of Iceland, and Dr. Riad Malki, the Foreign Minister of Palestine, formally confirmed the establishment of full diplomatic relations between Iceland and Palestine. The 2014 Fatah–Hamas Gaza Agreement provided for elections and the formation of a compromise unity government. The 2014 Israel–Gaza conflict intervened, however the unity government survived. In August, Palestinian leaders said they would apply to the United Nations Security Council for the establishment of a timetable for ending the Israeli occupation in the West Bank. The application would be made on 15 September 2014, following an Arab League meeting on 5 September at which support for the move would be requested. Unless a timetable was established, the Palestinian leadership said it would apply to the International Criminal Court where it would hold Israel responsible for its actions not only in the West Bank, but in the Gaza Strip. The international community regards the West Bank as territories occupied by Israel. Israel has withdrawn its military forces from the Gaza strip, but it continues to be designated the occupying power in the Gaza Strip by the United Nations, the United States and various human rights organizations. Hillel Neuer, the executive Director of UN Watch argues that the co-founder of Hamas, Mahmoud Zahar, has stated that Gaza is no longer occupied since the Israeli withdrawal. Zahar has elsewhere referred to the situation in Gaza as an "occupation". The final status of the Palestinian Territories as an independent state is supported by the countries that form the Quartet's "Road map for peace". The government of Israel has also accepted the road map but with 14 reservations. A transfer of powers and responsibilities for the Gaza Strip and Jericho took place pursuant to the Israel–PLO 4 May 1994 Cairo Agreement on the Gaza Strip and the Jericho Area. In other areas of the West Bank, transfer of powers took place pursuant to the Israel–PLO 28 September 1995 Interim Agreement, the Israel–PLO 15 January 1997 Protocol Concerning the Redeployment in Hebron, the Israel–PLO 23 October 1998 Wye River Memorandum, and the 4 September 1999 Sharm el-Sheikh Agreement. The DOP provides that Israel will retain responsibility during the transitional period for external security and for internal security and public order of Israeli settlements and citizens. Direct negotiations to determine the permanent status of Gaza and the West Bank had begun in September 1999 after a three-year hiatus, but have been derailed by the al-Aqsa Intifada that began in September 2000. In 2003, the Israeli government issued a plan for total withdrawal from the Gaza Strip and part of the northern West Bank by late 2005. This became known as the Disengagement Plan. The Palestinian Authority welcomed this plan, but declared that until final status, it would still consider the Gaza Strip under Israeli occupation. Many Israelis opposed the plan, and tensions were very high in Israel before and after the Disengagement Plan was approved by the Israeli Knesset on 16 February 2005. In August 2005, the Israel Defense Forces and Israeli police forcibly removed all settlers from the Gaza Strip. Israel completed the disengagement on 12 September 2005. Presently, most of the West Bank is administered by Israel though 42% of it is under varying degrees of autonomous rule by the Fatah-run Palestinian Authority. The Gaza Strip is currently under the control of Hamas. The International Criminal Court (ICC) is an independent international treaty organisation with its own legislative assembly. Many of the member states recognise the State of Palestine. The Palestinian Foreign Minister Riad al-Malki presented the ICC prosecutor with documentary evidence which shows that 67 states in Latin America, Asia, Africa, and Europe have legally recognised the State of Palestine. In January 2010, King Abdullah of Jordan, after a meeting with the Israeli president Shimon Peres at the World Economic Forum in Davos, declared that his country does not want to rule the West Bank and that "the two-state solution" to the Israeli–Palestinian conflict was the only viable option. If rule over the territory was to be transferred to the kingdom, it would only "replace Israeli military rule with Jordanian military rule... and the Palestinians want their own state". On Thursday, 29 November 2012, In a 138–9 vote (with 41 abstaining) General Assembly resolution 67/19 passed, upgrading Palestine to "non-member observer state" status in the United Nations. The new status equates Palestine's with that of the Holy See. The change in status was described by The Independent as "de facto recognition of the sovereign state of Palestine". The vote was a historic benchmark for the partially recognised State of Palestine and its citizens, whilst it was a diplomatic setback for Israel and the United States. Status as an observer state in the UN will allow the State of Palestine to join treaties and specialised UN agencies, including the International Civil Aviation Organisation, the International Criminal Court, and other organisations for recognised sovereign nations. It shall permit Palestine to claim legal rights over its territorial waters and air space as a sovereign state recognised by the UN, and allow the Palestinian people the right to sue for control of their claimed territory in the International Court of Justice and to bring war-crimes charges against Israel in the International Criminal Court. Customary international law, including the International Court of Justice's interpretation of the Fourth Geneva Convention in their July 2004 ruling, has been widely interpreted as prohibiting Israel from building settlements, due to its clauses prohibiting the transfer of a civilian population into an occupied territory. This was reaffirmed 5 December 2001, at the Conference of High Contracting Parties to the Fourth Geneva Convention. The participating High Contracting Parties called upon Israel "to fully and effectively respect the Fourth Geneva Convention in the Occupied Palestinian Territory, including East Jerusalem, and to refrain from perpetrating any violation of the Convention. They reaffirm the illegality of the settlements in the said territories and of the extension thereof." Article 47 of the Fourth Geneva Convention prohibits any change of status in occupied territory concluded through negotiations between the occupying power and local authorities under occupation. This finding also suggests that Israel may be in violation of the Rome Statute (one of the primary legal instruments of the International Criminal Court), Article 8, section (2)(b)(viii): "The transfer, directly or indirectly, by the Occupying Power of parts of its own civilian population into the territory it occupies, or the deportation or transfer of all or parts of the population of the occupied territory within or outside this territory" see:. Given that United Nations General Assembly resolution 67/19 upgraded Palestine to non-member observer state status in November 2012, representatives of Palestine may now be able to take members of the Israeli government to the International Criminal Court under violations of the Rome Statute. On 31 January 2012, the United Nations independent "International Fact-Finding Mission on Israeli Settlements in the Occupied Palestinian Territory" filed a report stating that if Israel did not stop all settlement activity immediately and begin withdrawing all settlers from the West Bank, it potentially might face a case at the International Criminal Court, increasing credibility of any Palestinianin attempt to do so. The UN has, after granting Palestine observer state status, permitted Palestine to title its representative office to the UN as 'The Permanent Observer Mission of the State of Palestine to the United Nations', seen by many as a reflexion of the UN's de facto recognition of the State of Palestine's sovereignty, and Palestine has started to re-title its name accordingly on postal stamps, official documents and passports. The Palestinian authorities have also instructed its diplomats to officially represent 'The State of Palestine', as opposed to the 'Palestine National Authority'. Additionally, on 17 December 2012, UN Chief of Protocol Yeocheol Yoon decided that 'the designation of "State of Palestine" shall be used by the Secretariat in all official United Nations documents'. Critics point out that implementation of the Oslo Accords has not improved conditions for the population under occupation. Israel contends that the settlements are not illegal as the West Bank is considered a "disputed territory" under international law. United Nations Security Council Resolution 242 recognized Israel's rights to "safe and secure borders", which has been interpreted by Israeli government as meaning that Israel had a right to West Bank territory for secure borders. The San Remo Conference, binding under international law, further envisioned the West Bank as being part of a sovereign Jewish state, and arguably encourages, rather than prohibits Jewish settlement in the area. Furthermore, according to Israeli government, many of the settlements were established on the sites of former Jewish communities that had existed there prior to 1947 on land that was legitimately bought, and ethnically cleansed by Arab forces. Israel views the territory as being the subject of legitimate diplomatic dispute and negotiation under international law. East Jerusalem, captured in 1967, was unilaterally annexed by Israel. The UN Security Council Resolution 478 condemned the annexation as "a violation of international law". This annexation has not been recognized by other nations, although the United States Congress declared its intention to recognize the annexation (a proposal that has been condemned by other states and organizations). Because of the question of Jerusalem's status, no states base their diplomatic missions there and treat Tel Aviv as the capital, though two states have embassies in the Jerusalem suburb of Mevaseret Zion. Israel asserts that these territories are not currently claimed by any other state, and that Israel has the right to control them. Israel's position has not been accepted by most countries and international bodies, and the West Bank (including East Jerusalem) and the Gaza Strip are referred to as occupied territories (with Israel as the occupying power) by most international legal and political bodies, the rest of the Arab bloc, the UK, including the EU, the United States, both the General Assembly and Security Council of the United Nations, the International Court of Justice, the Conference of High Contracting Parties to the Fourth Geneva Convention, and the Israeli Supreme Court (see Israeli West Bank barrier). Former U.S. President George W. Bush stated, during his presidency, that he did not expect Israel to return entirely to pre-1967 borders, due to "new realities on the ground." Both US President Bill Clinton and UK Prime Minister Tony Blair, who played notable roles in attempts at mediation, noted the need for some territorial and diplomatic compromise on this issue, based on the validity of some of the claims of both sides. One compromise offered by Clinton would have allowed Israel to keep some settlements in the West Bank, especially those in large blocks near the pre-1967 borders of Israel. In return, Palestinians would have received concessions of land in other parts of the country. The United Nations did not declare any change in the status of the territories as of the creation of the Palestinian National Authority between 1993 and 2000, although a 1999 U.N. document implied that the chance for a change in that status was slim at that period. In January 2010, King Abdullah of Jordan, after a meeting with the Israeli president Shimon Peres at the World Economic Forum in Davos, declared that his country does not want to rule the West Bank and that "the two-state solution" to the Israeli–Palestinian conflict was the only viable option. If rule over the territory was to be transferred to the kingdom, it would only "replace Israeli military rule with Jordanian military rule... and the Palestinians want their own state." In December 2010, Brazil recognized Palestine as a state with its 1967 borders. This move was later followed by Argentina, Peru, Uruguay, Bolivia and Ecuador. This action was later criticized by Israel and the United States, who labelled it "counterproductive". The Palestinian Central Bureau of Statistics (PCBS) estimated Palestinians at mid year 2009 as 10.7 million persons as follows: 3.9 million in the Palestinian Territory (36.6%), 1.2 million (11.5%) in Israel; 5.0 million in Arab countries (46.2%), 0.6 million in foreign countries (5.7%). According to The Guardian (2008) the Palestinian territories have one of the fastest growing populations in the world, with numbers surging 30% in the past decade (2008). There were 3.76 million Palestinians in the West Bank and the Gaza Strip, up from 2.89 million ten years earlier. According to the U.S. Census, population growth from 1990 to 2008 in Gaza and the West Bank was 106%, from 1.9 million (1990) to 3.9 million persons. According to the UN (2010), the Palestinian population was 4.4 million. According to the Palestinian Central Bureau of Statistics (PCBS) population density in 2009 was 654 capita/km2, of which 433 capita/km2 in the West Bank including Jerusalem and 4,073 capita/km2 in Gaza Strip. In mid-2009, the share of population less than 15 years was 41.9% and above 65 years 3%. The overwhelming majority of Palestinians are Muslims. Almost the entire Palestinian Muslim population is Sunni, although few dozen converts to Ahmadiyya Islam resides in West Bank. According to Palestinian constitution, article 4: "Islam is the official religion of Palestine. Respect for the sanctity of all other divine religions shall be maintained". Christians constitute about 1–2% of population of Palestinian territories. The Christian population of Gaza is estimated at about 3,000 There are also about 370 Samaritans in West Bank village of Kiryat Luza on Mount Gerizim who hold both Palestinian and Israeli citizenship. The number of Jewish settlers in West Bank is estimated at 341 000 as of the end of 2012 and over 200 000 in East Jerusalem. Arabic is the official language within the Palestinian Authority. Palestinian Arabic is the vernacular. Hebrew and English are widely spoken. 16.1% of the population speaks Hebrew as their native language and Hebrew is also a second or third language to many other Palestinians. The PCBS estimated that about 564,000 Israeli settlers lived in the West Bank in 2012. Some 203,000 of them were settled in East Jerusalem (Area J1 of the Jerusalem Governorate) and 346,000 in the remaining West Bank. Consistent with its policy of Jerusalem as a united and indivisible capital of Israel, Israel does not publish exact figures of the number of settlers in East Jerusalem. Rather the figures of Israelis in Judea and Samaria District are given. Independently from the political composition of its subsequent governments, the number of settlers in the West Bank has grown rapidly and in a relatively straight line since 1967 (see graphics). The Israeli Central Bureau of Statistics counted about 341,000 settlers end 2012 in the Judea and Samaria District, which does not include Jerusalem. The Constitution of the League of Arab States says the existence and independence of Palestine cannot be questioned de jure even though the outward signs of this independence have remained veiled as a result of force majeure. The League supervised the Egyptian trusteeship of the Palestinian government in Gaza after the termination of the British Mandate and secured assurances from Jordan that the 1950 Act of Union was "without prejudice to the final settlement". By the 1988 declaration, the PNC empowered its central council to form a government-in-exile when appropriate, and called upon its executive committee to perform the duties of the government-in-exile until its establishment. Under the terms of the Oslo Accords signed between Israel and the PLO, the latter assumed control over the Jericho area of the West Bank and the Gaza Strip on 17 May 1994. On 28 September 1995, following the signing of the Israeli–Palestinian Interim Agreement on the West Bank and Gaza Strip, Israeli military forces withdrew from the West Bank towns of Nablus, Ramallah, Jericho, Jenin, Tulkarem, Qalqilya and Bethlehem. In December 1995, the PLO also assumed responsibility for civil administration in 17 areas in Hebron. While the PLO assumed these responsibilities as a result of Oslo, a new temporary interim administrative body was set up as a result of the Accords to carry out these functions on the ground: the Palestinian National Authority (PNA). An analysis outlining the relationship between the PLO, the PNA (PA), Palestine and Israel in light of the interim arrangements set out in the Oslo Accords begins by stating that, "Palestine may best be described as a transitional association between the PA and the PLO." It goes on to explain that this transitional association accords the PA responsibility for local government and the PLO responsibility for representation of the Palestinian people in the international arena, while prohibiting it from concluding international agreements that affect the status of the occupied territories. This situation is said to be accepted by the Palestinian population insofar as it is viewed as a temporary arrangement. Since the Battle of Gaza (2007), the two separate territories, the Gaza Strip and the West Bank, are divided into a Hamas leadership in the Gaza Strip and a Fatah civil leadership in the autonomous areas of the West Bank. Each sees itself as the administrator of all Palestinian Territories and does not acknowledge the other one as the official government of the territories. The Palestinian Territories have therefore de facto split into two entities. After the signing of the Oslo Accords, the Palestinian territories were divided 16 governorates under the jurisdiction of the Palestinian National Authority. Since 2007 there are two governments claiming to be the legitimate government of the Palestinian National Authority, one based in the West Bank and one based in the Gaza Strip. 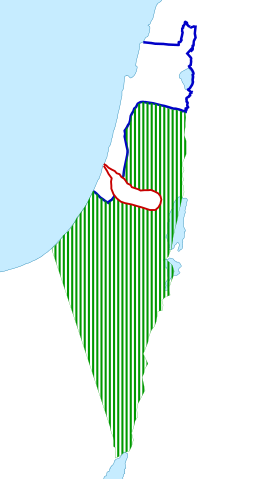 The Oslo II Accord created three temporary distinct administrative divisions in the Palestinian territories, the Areas A, B and C, until a final status accord would be established. The areas are not contiguous, but rather fragmented depending on the different population areas as well as Israeli military requirements. 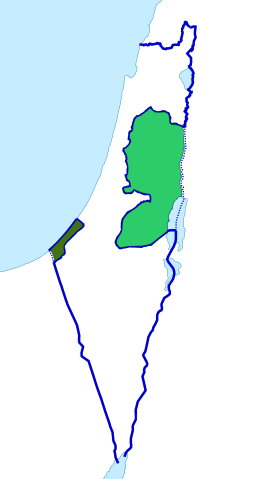 Area A (in theory, full civil and security control by the Palestinian Authority): circa 3% of the West Bank, exclusive East-Jerusalem (first phase, 1995). In 2011: 18%. This area includes all Palestinian cities and their surrounding areas, with no Israeli settlements. Entry into this area is forbidden to all Israeli citizens. The Israel Defense Forces occasionally enters the area to conduct raids to arrest suspected militants. 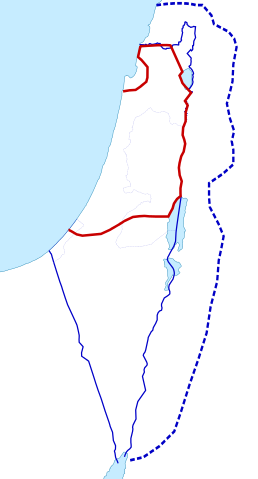 Area B (Palestinian civil control and joint Israeli–Palestinian security control): circa 25% (first phase, 1995). In 2011: 21%. Includes areas of many Palestinian towns and villages and areas, with no Israeli settlements. Area C (full Israeli civil and security control, except over Palestinian civilians): circa 72% (first phase, 1995). In 2011: 61%. These areas include all Israeli settlements (cities, towns, and villages), nearby land, most roadways that connected the settlements (and which Israelis are now restricted to) as well as strategic areas described as "security zones." There were 1,000 Israeli settlers living in Area C in 1972. By 1993, their population had increased to 110,000. As of 2012[update] they number more than 300,000 – as against 150,000 Palestinians, the majority of whom are Bedouin and fellahin. In 1922, after the collapse of the Ottoman Empire that ruled Greater Syria for four centuries (1517–1917), the British Mandate for Palestine was established. Large-scale Jewish immigration from abroad, mainly from Eastern Europe took place during the British Mandate, though Jewish immigration started during the Ottoman period. The future of Palestine was hotly disputed between Arabs and Jews. In 1947, the total Jewish ownership of land in Palestine was 1,850,000 dunams or 1,850 square kilometres (714 sq mi), which is 7.04% of the total land of Palestine. Public property or "crown lands", the bulk of which was in the Negev, belonging to the government of Palestine may have made up as much as 70% of the total land; with the Arabs, Christians and others owning the rest. The 1947 United Nations Partition Plan proposed a division of Mandate Palestine between an Arab and a Jewish state, with Jerusalem and the surrounding area to be a corpus separatum under a special international regime. The regions allotted to the proposed Arab state included what became the Gaza Strip, and almost all of what became the West Bank, as well as other areas. After the war, which Palestinians call the Nakba, the 1949 Armistice Agreements established the separation lines between the combatants, leaving Israel in control of some of the areas designated for the Arab state under the Partition Plan, Transjordan in control of the West Bank, including East Jerusalem, Egypt in control of the Gaza Strip and Syria in control of the Himmah Area. In 1950, Jordan annexed the West Bank. Only the United Kingdom formally recognized the annexation of the West Bank, excluding the case of East Jerusalem which was de facto recognized. In the Gaza Strip the Arab League formed the All-Palestine Government, which operated under Egypt occupation. Article 24 of the Palestinian National Covenant of 1964, which established the Palestine Liberation Organization, stated: "This Organization does not exercise any territorial sovereignty over the West Bank in the Hashemite Kingdom of Jordan, on the Gaza Strip or in the Himmah Area" (i.e. the areas of the former Mandate Palestine controlled by Jordan, Egypt and Syria, respectively). Israel captured both territories in the 1967 Six-Day War, as well as other territory belonging to Egypt and Syria. Since then, these territories have been designated Israeli-occupied territories. Immediately after the war, on 19 June 1967, the Israeli government offered to return the Golan Heights to Syria, the Sinai to Egypt and most of the West Bank to Jordan in exchange for peace. At the Khartoum Summit in September, the Arab parties responded to this overture by declaring "no peace with Israel, no recognition of Israel and no negotiations with Israel." UN Security Council Resolution 242 introduced the "Land for Peace" formula for normalizing relations between Israel and its neighbors. This formula was used when Israel returned the Sinai Peninsula to Egypt in 1979 in exchange for a peace treaty. While that treaty mentioned a "linkage" between Israeli–Egyptian peace and Palestinian autonomy, the formerly Egyptian-occupied territory in Gaza was excluded from the agreement, and remained under Israeli control. ^ a b "CIA – The World Factbook". cia.gov. Retrieved 28 November 2012. ^ "CIA – The World Factbook". cia.gov. Retrieved 28 November 2012. ^ "| Human Development Reports" (PDF). Hdr.undp.org. Retrieved 10 June 2016. ^ Le More, Anne (2008). International assistance to the Palestinians after Oslo: political guilt, wasted money. Routledge studies on the Arab-Israeli conflict. 1. London and New York: Routledge. p. 29. ISBN 978-0-415-45385-1. ^ Le More, Anne (2008). International assistance to the Palestinians after Oslo: political guilt, wasted money. Routledge studies on the Arab-Israeli conflict. 1. London and New York: Routledge. p. 27. ISBN 978-0-415-45385-1. ^ a b c "December Overview" (PDF). UNOCHA. December 2009. Archived from the original (PDF) on 16 February 2010. Retrieved 3 January 2010. ^ "Israeli practices affecting the human rights of the Palestinian people in the Occupied Palestinian Territory, including East Jerusalem: Report of the Secretary-General (UN Doc. A/71/364)". United Nations. 30 August 2016. Retrieved 29 November 2016. ^ "European Union, Trade in goods with Occupied Palestinian Territory" (PDF). European Commission / Directorate-General for Trade. 4 November 2016. Retrieved 29 November 2016. ^ "Council conclusions on the Middle East Peace Process". Council of the European Union. 18 January 2016. Retrieved 29 November 2016. The Council highlights the importance of unhindered work of civil society both in Israel and the occupied Palestinian territory and follows recent developments in this regard with concern. ^ O'Brien, Patricia (21 December 2012). "Issues related to General assembly resolution 67/19 on the status of Palestine in the United nations" (PDF). United Nations. Retrieved 9 October 2018. ^ "Name Change: State of Palestine"
^ McHigh, Jess (19 August 2015). "Israel-Palestine Conflict: French UN Security Council Resolution Off The Table In Favor Of Palestinian Statehood?". International Business Times. Retrieved 22 October 2015. ^ United Nations. "UN Charter". United Nations. Archived from the original on 26 September 2011. Retrieved 21 November 2014. ^ FAQ: The Peace process with the Palestinians – Dec 2009. Mfa.gov.il. Retrieved on 2012-01-15. ^ From "Occupied Territories" to "Disputed Territories," by Dore Gold. Jcpa.org. Retrieved on 2012-01-15. ^ Jonathan Kuttab; Claude Klein (2000). "5. Access to Jerusalem and the Holy Places". Jerusalem:Points Beyond Friction and Beyond. Kluwer Law International. p. 68. ISBN 9041188436. ^ "Primer domingo. De Jerusalén a Ramala – ana". ^ Barahona, Ana (2013). Bearing Witness – Eight weeks in Palestine. London: Metete. p. 12. ISBN 978-1-908099-02-0. ^ Shlomo Slonim, Jerusalem in America's Foreign Policy: 1947–1997, Martinus Nijhoff Publishers, 1998 pp.332–333. ^ Menachem Klein, ['Jerusalem: The Contested City,'] C. Hurst & Co. Publishers, 2001 pp.189ff., passim. ^ Dugard, John (1987). Recognition and the United Nations. Cambridge: Grotius Publications Limited. pp. 111–115. ISBN 0-521-46322-X. ^ 'Humanitarian Fact Sheet on the Jordan Valley and the Dead Sea Area,' Archived 7 November 2012 at the Wayback Machine OCHA, February 2012. ^ "Hamas leader's Tunisia visit angers Palestinian officials". English.alarabiya.net. 7 January 2012. Retrieved 26 December 2012. ^ a b Keinon, Herb. "Politics: Fatah-Hamas unity talks breed Likud harmony". The Jerusalem Post. Retrieved 21 June 2014. ^ a b "Set 'timetable' to end Israeli occupation, Palestine to UN". Arab Herald. 28 August 2014. Retrieved 28 August 2014. ^ "The occupied Palestinian territories: Dignity Denied". International Committee of the Red Cross. 13 December 2007. Retrieved 26 December 2012. ^ "UK and The Occupied Palestinian Territories". GOV.UK. Retrieved 29 November 2016. ^ "House of Commons International Development Committee – FINAL REPORT Vol I 26 January 2004" (PDF). Retrieved 30 June 2010. ^ a b "Definition of Palestinian Autonomous Areas". Collins English Dictionary. Retrieved 28 November 2012. ^ "In Depth | World | Israel and the Palestinians". BBC News. Retrieved 3 January 2013. ^ Joseph Gorny; Yosef Gorni (1983). The British labour movement and Zionism, 1917–1948. Routledge. p. 138. ISBN 978-0-7146-3162-2. The Jewish people have always regarded, and will continue to regard Palestine as a whole, as a single country which is theirs in a national sense and will become theirs once again. No Jew[dubious – discuss] will accept partition as a just and rightful solution. ^ Shlaim, Avi (2008). The Iron Wall: Israel and the Arab World. Paw Prints. p. 670. ISBN 978-1-4352-9513-1. ^ The Likud—Platform states "The Government of Israel flatly rejects the establishment of a Palestinian Arab state west of the Jordan River. The Palestinians can run their lives freely in the framework of self-rule, but not as an independent and sovereign state." ^ Barahona, Ana (2013). Bearing Witness – Eight weeks in Palestine. London: Metete. p. 77. ISBN 978-1-908099-02-0. ^ Based on figures of the CIA World Factbook. The Factbook estimates the land area of Israel (excluding the Golan Heights) 20,330 square kilometer, the West Bank (including East Jerusalem, but excluding Mt. Scopus) 5,640 and the Gaza Strip 360. ^ "UN makes Palestine nonmember state". 3 News NZ. 30 November 2012. Archived from the original on 16 January 2013. Retrieved 29 November 2012. ^ "Palestinians accuse Romney of 'racist' remark". Al Jazeera. 31 July 2012. Retrieved 26 December 2012. ^ "Romney calling Jerusalem Israel's capital is 'unacceptable,' says Erekat". Haaretz. Associated Press. 30 July 2012. Retrieved 26 December 2012. ^ "Israel Gaza blockade must be completely lifted". Amnesty.org. Retrieved 26 December 2012. ^ "MIDEAST: Border Areas Bombed Again". Ipsnews.net. 12 March 2009. Retrieved 26 December 2012. ^ "Department of the Treasury, Customs Service, T.D. 97–16, Country of Origin Marking of Products From the West Bank and Gaza" (PDF). Retrieved 30 June 2010. ^ "USAID West Bank/Gaza". Usaid.gov. Archived from the original on 9 October 2009. Retrieved 30 June 2010. ^ "West Bank and Gaza — Strategic Objective: 294-001" (PDF). Archived from the original (PDF) on 27 July 2009. Retrieved 30 June 2010. ^ Embassy of France. "International Donors' Conferences for the Palestinian State". Ambafrance-us.org. Retrieved 30 June 2010. ^ "Gaza's Future, Henry Siegman, London Review of Books". Lrb.co.uk. Retrieved 30 June 2010. ^ Suzanne Goldenberg in Washington (4 March 2008). "US plotted to overthrow Hamas after election victory, Suzanne Goldenberg, The". London: Guardian. Retrieved 30 June 2010. ^ "Rabin Made Mistake Arming Arafat – Olmert Makes Same Mistake Arming Abbas". Zoa.org. Retrieved 30 June 2010. ^ "The Gaza Bombshell, David Rose, Vanity Fair, April 2008, page 3". Vanityfair.com. 20 October 2009. Retrieved 30 June 2010. ^ "See the text of UN Security Council Resolution 1860 (2009)". Un.org. 8 January 2009. Retrieved 30 June 2010. ^ Iceland Recognizes Palestine, Iceland's Ministry for Foreign Affairs. ^ Israel/Occupied Palestinian Territories: The conflict in Gaza: A briefing on applicable law, investigations and accountability Amnesty International. 19 January 2009. Retrieved 2009-06-05; Human Rights Council Special Session on the Occupied Palestinian Territories Human Rights Watch, 6 July 2006; Is Gaza 'occupied' territory? CNN, 6 January 2009. Retrieved 2009-05-30. ^ Neuer, Hillel C. "Hamas says Gaza 'not occupied'; UN disagrees – Opinion – Jerusalem Post". Jpost.com. Retrieved 10 June 2016. ^ "Interview: Mahmoud al-Zahar". Al Jazeera English. 8 February 2009. Retrieved 10 June 2016. ^ "ICC prosecutor considers 'Gaza war crimes' probe". Archived from the original on 22 August 2009. ^ "King Abdullah: Jordan wants no part of West Bank". Haaretz.com. 29 January 2010. Retrieved 4 October 2014. ^ a b "A/67/L.28 of 26 November 2012 and A/RES/67/19 of 29 November 2012". Unispal.un.org. Archived from the original on 10 December 2012. Retrieved 2 December 2012. ^ a b c Inside Story (8 January 2013). "Palestine: What is in a name (change)?". Al Jazeera English. Retrieved 10 June 2016. ^ "Palestinians' UN upgrade to nonmember observer state: Struggles ahead over possible powers". Washington Post. 30 November 2012. ^ The Mitchell Report BBC, 29 November 2001. ^ "Conference of High Contracting Parties to the Fourth Geneva Convention: Declaration". Domino.un.org. Archived from the original on 12 June 2012. Retrieved 26 December 2012. ^ "Rome Statute of the International Criminal Court". Untreaty.un.org. Archived from the original on 12 January 2013. Retrieved 26 December 2012. ^ Harriet Sherwood, Israel must withdraw all settlers or face ICC, says UN report, The Guardian, 31 January 2013. ^ Independent UN inquiry urges halt to Israeli settlements in occupied Palestinian territory, United Nations News Center, 31 January 2012. ^ Human Rights Council Twenty-second session, Agenda item 7, Human rights situation in Palestine and other occupied Arab territories, Report of the independent international fact-finding mission to investigate the implications of the Israeli settlements on the civil, political, economic, social and cultural rights of the Palestinian people throughout the Occupied Palestinian Territory, including East Jerusalem(Advanced Unedited Version), accessed 1 February 2013. ^ Heruti, Tali (5 January 2013). "Palestinian Authority Officially Changes Name to 'State of Palestine'". Haaretz. Retrieved 10 June 2016. ^ "Israeli Settlements and International Law, Israel Foreign Ministry website". Mfa.gov.il. 20 May 2001. Retrieved 26 December 2012. ^ "Foreign Missions in Israel -Continents". Mfa.gov.il. 30 May 2007. Retrieved 30 June 2010. ^ a b c "United Nations International Meeting on the Convening of the Conference on Measures to Enforce the Fourth Geneva Convention in the Occupied Palestinian Territory, including Jerusalem, UN website, Cairo, 14 and 15 June 1999". Unispal.un.org. Archived from the original on 10 November 2013. Retrieved 26 December 2012. ^ "israelinsider: diplomacy: Defense Secretary Rumsfeld: West Bank is not "occupied territory"". 10 March 2007. Archived from the original on 10 March 2007. ^ "Conference of High Contracting Parties to the Fourth Geneva Convention: Declaration – Switzerland text/Non-UN document (5 December 2001)". Unispal.un.org. Archived from the original on 4 May 2011. Retrieved 30 June 2010. ^ "Israel 'to keep some settlements'". BBC News. 12 April 2005. Retrieved 26 December 2012. ^ "Ecuador becomes fifth Latin American country to recognize Palestinian state". Haaretz. 25 December 2010. Retrieved 25 December 2010. ^ Toni O'Loughlin in Jerusalem (11 February 2008). "Census finds Palestinian population up by 30%". The Guardian. Retrieved 26 December 2012. ^ passia.org Archived 24 September 2012 at the Wayback Machine Palestine facts – Population. ^ As stated in List of sovereign states and dependent territories by population density, in 2010, the total density raised to 681, ranking the 20th biggest of this list. ^ "Myths & Facts: Israel-Palestine conflict and the Ahmadiyya". Archived from the original on 27 September 2016. Retrieved 17 October 2016. ^ "2003 Amended Basic Law". 17 February 2008. ^ Reuters. "Declining Palestinian Christian Population Fears Its Churches Are Turning Into Museums" – via Haaretz. ^ IMEU. "Palestinian Christians in the Holy Land – IMEU". ^ "Israeli Election Preview: The Samaritans, Caught Between Two Votes". 21 January 2013. ^ "A look at Israeli settlers, by the numbers". ^ The Palestine Basic Law Archived 18 January 2012 at the Wayback Machine, approved by the PLC in March 2003, states in article 4 that "Arabic shall be the official language." ^ "Palestine". Tlfq.ulaval.ca. Retrieved 3 January 2013. ^ Barahona, Ana (2013). Bearing Witness – Eight weeks in Palestine. London: Metete. p. 80. ISBN 978-1-908099-02-0. ^ "Israeli Settler Population 1972–2006". Foundation for Middle East Peace. Archived from the original on 18 November 2008. Retrieved 15 March 2010. ^ Table 2.17—Localities(1) and population (see end of table). ICBS, STATISTICAL ABSTRACT OF ISRAEL 2013, 5 March 2014. Note: different dates of counting is one of the reasons for differing statistics. ^ Sayigh, 1999, p. 624. ^ Europa World Publications, 2004, p. 905. ^ Dajani in Brownlie et al., 1999, p. 121. ^ a b c "Map No. 1 – First Phase of Redeployment". Retrieved 3 January 2013. ^ Alexander Safian, Can Arabs Buy Land in Israel?, Middle East Quarterly Volume IV, Number 4, December 1997; citing Moshe Aumann, Land Ownership in Palestine 1880–1948, Israel Academic Committee on the Middle East (undated, approximately 1970). The Negev statement is in Aumann. ^ "Khartoum Resolutions". Mideastweb.org. 19 June 1967. Retrieved 30 June 2010. ^ Israeli documentation provides population figures for the whole of Jerusalem without specific information on East Jerusalem being provided. Global Integrity Report: West Bank has a governance and anti-corruption profile. "West Bank". The World Factbook. Central Intelligence Agency. Palestine from UCB Libraries GovPubs. "The Question of Palestine & the United Nations". , published by the United Nations Department of Public Information, March 2003. UN Brochure DPI/2276. Online, chapters are in PDF format.